The Hindu nationalist Bharatiya Janata Party has won assembly elections in the southern Indian state of Karnataka. The party is three seats short of an overall majority, but well ahead of the Congress, which leads the national coalition government. The victory is significant as for the first time, the party will be heading a government of its own in the south. Karnataka is politically important and its capital, Bangalore, is the hub of India's booming IT industry. Voting was held in three phases on 10, 16 and 22 May. 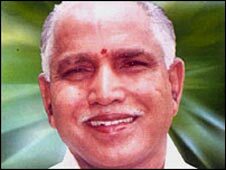 The Bharatiya Janata Party (BJP) formed a government in November last year, led by chief minister BS Yeddyurappa, together with its coalition ally Janata Dal (Secular) party. The government collapsed a week later after the alliance partner decided to oppose Mr Yeddyurappa in a confidence vote. After results were announced, Mr Yeddyurappa said that as the largest single party, the BJP should be allowed to lead a government and would be supported by other groups. "We are confident of [forming] the government, there is no doubt about it," he said. Senior BJP leader, Arun Jaitley, speaking in Delhi, expressed satisfaction over the results, which he said were expected. "The meeting of the newly elected (party legislators) would be held on Monday in Bangalore, where Mr Yeddyurappa will be formally elected as the leader of the BJP's legislators party," he said. 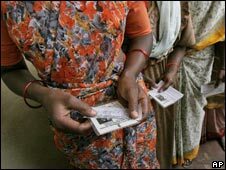 The last assembly elections were held in Karnataka in 2004. No party gained a majority in the 224-member state assembly. The BJP was the largest party with 79 seats, but Congress with its 64 members aligned with 58 Janata Dal (S) members to form the government. The government lasted for 20 months before the two split. In February 2006, the Janata Dal (S) and BJP formed a coalition government. The two parties agreed that each would have the chief minister's post for 20 months. The state assembly was suspended on October 2007 and federal rule imposed after the Janata Dal (S) refused to give up the chief minister's chair in favour of the BJP candidate. A month later the two parties formed a government with BJP heading the coalition. A week later the coalition fell apart with the two parties failing to come to an agreement over power sharing and fresh elections were called.